Cardiff: Football can be a cruel game at times. With less than 10 minutes remaining, Cardiff were leading 1-0 and the mood in the away end was mutinous. “We want Sarri out” reverberated loud and clear time and again, so much so that it was tempting to wonder whether Chelsea’s manager was fighting to hold on to his job. How quickly things can change. By the time the final whistle blew the Chelsea fans were celebrating a victory that kept alive their hopes of a top-four finish and left Cardiff crestfallen. The killer goal was Cesar Azpilicueta’s equaliser, in the 84th minute, and it should never have been allowed to stand. The Chelsea captain was a yard offside as he nodded home Marcos Alonso’s flick on. Neil Warnock was furious, which is often the case although on this occasion it was impossible not to feel sympathy for the Cardiff manager. Azpilicueta’s goal will not be allowed to stand next season, when VAR is introduced in the Premier League. That, however, is no help to Cardiff, who remain five points adrift of safety after Ruben Loftus-Cheek headed in Willian’s cross to complete their misery. “It’s difficult because I am really flat. I am so proud of my players. To get let down by the officials ... roll on VAR,” said Warnock. “We worked three weeks for this but to get let down by decisions ... no major decisions went for us. “It’s not our fault an official can’t see that, it is the most obvious offside I have ever seen or the most certain penalty I have ever seen. “It’s the best league in the world but the worst officials. They don’t understand what is at stake. They shouldn’t make mistakes at this level. “Why am I working at 70 years of age for things like that to happen? It’s not very often I am lost for words. Chelsea could not have been more fortunate — this victory and performance were about as unconvincing as it gets. For all Chelsea’s possession in the first half, it had been hard to see where a goal would come from. There was no real pattern to their play, certainly no tempo to it, and a glaring lack of creativity whenever they got deep into Cardiff territory. Everything felt so slow and pedestrian, exasperating the travelling supporters, whose patience snapped after 33 minutes when the first anti-Sarriball chant broke out in the away end followed by “Super Frank Lampard”. The teamsheet had not helped Sarri’s cause. His surprise decision to “rest” Eden Hazard and N’Golo Kante, both of whom started on the bench, raised eyebrows before a ball was kicked. There was also no Premier League start for Callum Hudson-Odoi. In truth, the three of them could have been forgiven for feeling relieved to have played no part in a soporific opening 45 minutes. The only shot on target came via the right boot of Cardiff’s Lee Peltier, who has not scored a goal for six years. Although that was a weak attempt and easily saved by Kepa Arrizabalaga, at least Cardiff attacked with a bit of conviction. Josh Murphy, playing wide on the right, looked dangerous and, cutting back inside onto his favoured left foot, curled a low shot from an acute angle that flashed narrowly wide of the far upright. Pedro, linking well with Willian, curled a left-footed effort that skimmed the roof of the net early on, but it was close to half-time before Chelsea seriously threatened again. They should have scored, too. A training-ground set-piece routine saw Willian play a short corner and pick out Alonso, who had peeled off from the back post to the penalty spot. Totally unmarked, the Spaniard prodded a weak right-footed shot wide. It was a moment that summed up the first half. There were a couple of penalty appeals at either end that, on second viewing, may have had something to them. Gunnarsson had hold of Antonio Rudiger’s arm in the fourth minute while in the Chelsea area Alonso was certainly tugging Morrison’s shirt. Craig Pawson, the referee, was unmoved on both occasions. 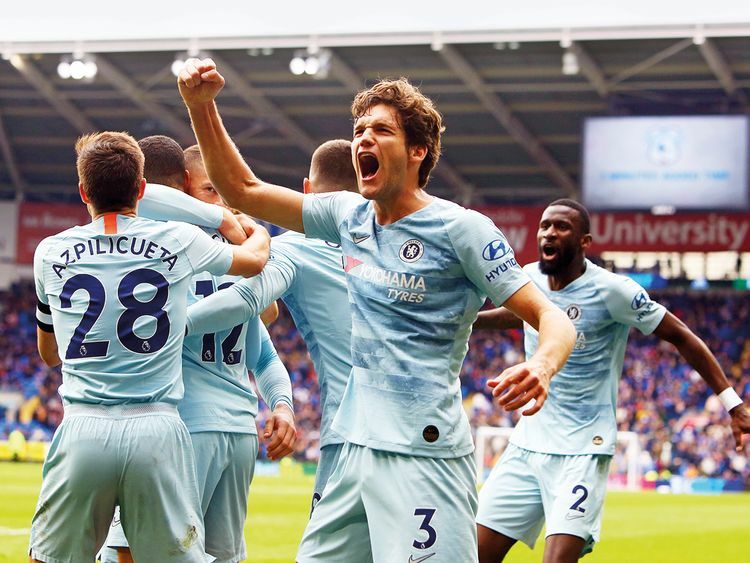 A breakthrough arrived within less than a minute of the restart and it felt in keeping with Chelsea’s performance that it was Cardiff who took the lead. Harry Arter, picking up possession from Gunnarsson wide on the right, whipped a low cross into the area and Camarasa, stood about 16 yards out, connected beautifully with a first-time volley that was still rising as it flew past Arrizabalaga. Cue more anger among the Chelsea fans, who started to call for Sarri to be dismissed. Hazard was brought on for Pedro and Ruben Loftus-Cheek replaced Jorginho, whose only notable contribution was the cynical foul on Murphy that earned him a yellow card in the first half. In between those two substitutions Morrison was at the centre of another rejected penalty appeal after Rudiger grabbed his arm. Hazard’s introduction at least injected a little life into Chelsea, yet they still struggled to carve out chances. Willian had one when Alonso found him in space in the Cardiff area but winger’s low angled drive skipped past the far post. Finally, six minutes from time, came the equaliser. Alonso glanced the ball on and Azpilicueta, clearly offside, headed in from inside the six-yard box. Loftus-Cheek then broke Cardiff hearts with the winner when he got inside Peltier to meet Willian’s cross with a far post header.